I had myself a merry little fake christmas in Dundee yesterday before I head back through to Glasgow. I used one of the new redwoods turkey roast thingies and it was mighty delicious. It seems to me like it's what you Amurrikens get, you know, that tofurkey thing? Yeah, it was like that, with the stuffing in the middle and whatnot. 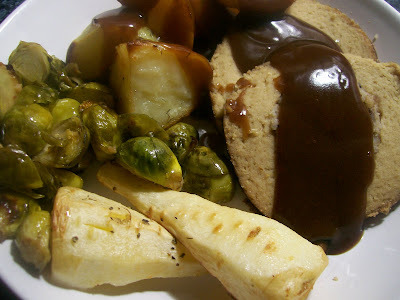 Served with roast parsnips, potatoes, brussel sprouts, and gravy. I could eat this again now.